This tutorial shows you how to export Compass records to RefWorks, EndNote, EasyBib, Bibtex or RIS. Here are the steps to export bibliographic records to RefWorks, EndNote, EasyBib and other reference management software systems from within Compass. Any individual records can be exported from a search results page. Simply expand or open the record, and several options will appear immediately underneath the author, title, and publication metadata. You can then select the appropriate reference management system for your export, and you will be redirected to login with your service or program. 1. 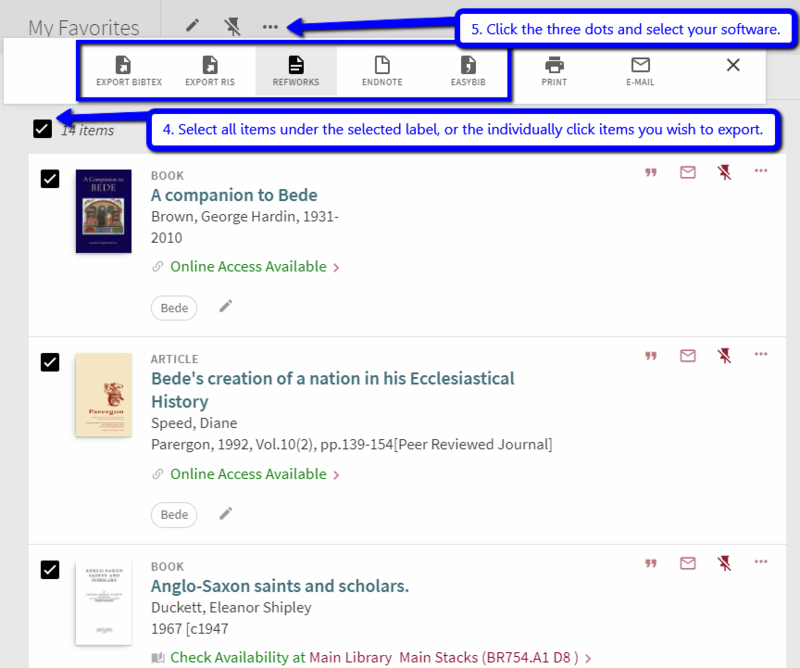 Save the items you'd like to export to the My Favorites menu (formerly called "e-Shelf") within Compass by clicking on the black pushpin associated with each record. This can be done from any search results page or record opened individually. For more information, see our dedicated FAQ for saving records in Compass. 2. Once you have saved all records that you'd like to export to My Favorites, click on the pushpin immediately to the left of your name in the top menubar. This will take you to My Favorites. 3. The My Favorites menu allows you to create and apply labels to the records you've saved. This is not a necessary process, but is helpful if you expect to save numerous records to My Favorites for different projects or classes. 4. In My Favorites, select the items you'd like to export using the numbered boxes. An unnumbered box at the top of the page will select all items under your label, if your viewing pane is limited to a particular label. 5. Click on the three horizontal dots at the top of the page to bring up your "Push to" options. You can then select the appropriate reference management system for your export, and you will be redirected to login with your service or program. Though EndNote appears as one of the export options, this may push to the Web version of EndNote. If you run into this problem and would prefer to export to the client version of EndNote installed locally on your computer, instead select "Export RIS." RIS is an interchange format that should automatically invoke the EndNote application. With further questions, please contact Chris Brown.